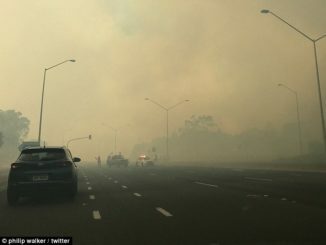 The Rural Fire Service said the fire was behaving "very aggressively"
Hundreds of Australian firefighters are tackling a large bushfire that has reportedly affected homes homes in the southern suburbs of Sydney. 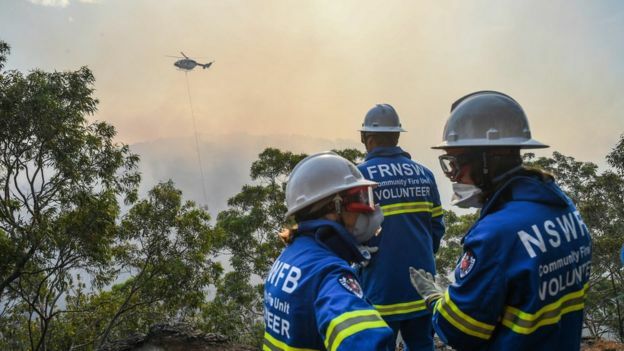 The New South Wales Rural Fire Service (RFS) said it was concerned that flying embers could spark new blazes ahead of the advancing fire front. 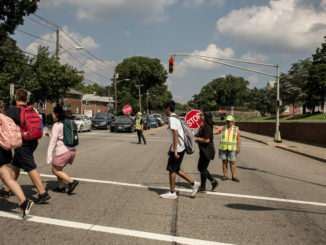 Some residents have been instructed to seek shelter as evacuation is now too dangerous. 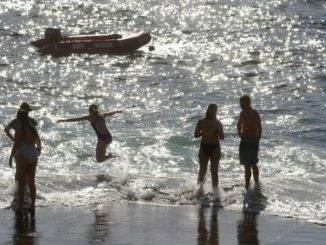 Recent weather in south-eastern Australia has been unseasonably hot. Shane Fitzsimmons from the RFS said the fire was behaving “very aggressively”. Strong winds have been pushing the flames north and east towards suburban areas. Passengers on a suburban train have filmed dramatic scenes as the railway took them through the burning countryside, surrounded by thick smoke and flying embers. The fire has burned nearly 2,500 hectares of land, the RFS said. More than 70 fire appliances were stationed along roads dividing bushland from homes while helicopters were dumping water on the fire from above, SBS reported. Prime Minister Malcolm Turnbull praised the emergency response. 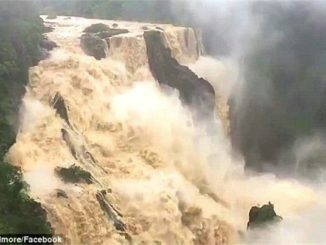 “It is unseasonably hot and that’s a matter of obviously great concern, but we have to deal with the worst that Mother Nature can throw at us and the worse Australians are presented with by nature, the better it brings out the Australian spirit,” he said. 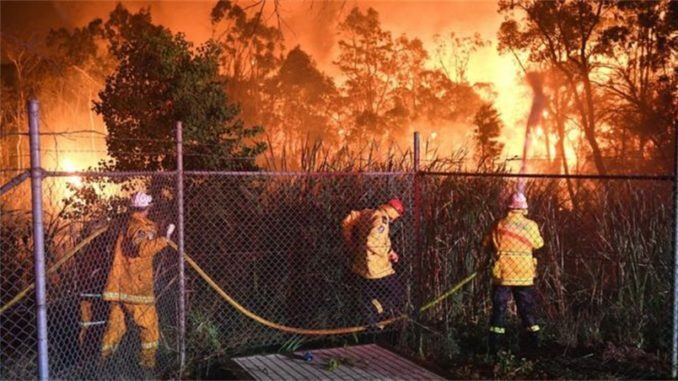 New South Wales police have declared the area a crime scene but the RFS says it is too early to know if the fire was started deliberately, SBS reported.